to the Sealy Convention & Visitors Bureau Visitor's Guide. 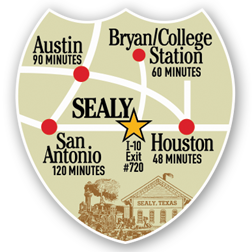 Sealy is a part of the Brazos Wine Trail, with extensive acreage of vineyards in the county. Nestled at the crossroads of Texas Highway 36 and Interstate 10 the City of Sealy now boasts a population between five and six thousand and is the largest city in Austin County. Spend a day in the Colonial Capital of Texas or an afternoon on the trail of bluebonnet farms. Sit back, relax and enjoy.